Nothing like a little leopard to kick the weekend off right! Here in L.A. we have "Carmageddon" happening over the weekend so I'm doing nothing but relaxing, BBQ'ing with friends, catching up on all my mags, getting a mani/pedi and soaking up some rays (with spf of course)! P.S. If you don't know what the hell I'm talking about Google Carmageddon.....It' wouldn't be LA if things weren't over exaggerated. Sheesh! loving leopard too!! your weekend sounds wonderful! i am somewhat near the 405 so it should be interesting this weekend! Love this! This is the perfect Friday outfit! LOVE that oversized clutch too! Love this outfit, love how the shorts just peek through the bottom! It's pretty crazy the 405 will be closed down for a couple day. I adore how you transformed the leopard jacket into a top! Looks fantastic. seems like u are having a great time! lovely bag! That leopard print looks hot! The background of the mountains is very beautiful as well. Have a great weekend! Beautiful blouse. I like it with shorts. It sounds like you'll have an amazing weekend. Enjoy. 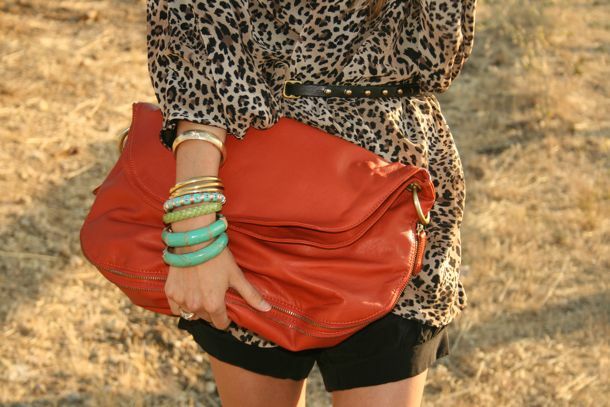 Love this - the red bag is perfect with the leopard. And it sounds like you have the perfect weekend lined up, have fun! I love your shoes. Just discovered your blog today! It's lovely. Gorgeous outfit, I love that you worked the jacket as a top, it looks stunnning! Love the red bag and mixed bracelets too-perfect accessories. I'm in leopard love too, hon. This is HOTNESS! Ah yes. Leopard. A girls favorite thing ever!! Awesome shoes, awesome top, awesome bag! Hi I am a new follower:) I love your outfit, i'm obsessed with leopard print! Que bien sienta ese estampado y el detalle del bolso rojo!!! Fantástico! so beautiful! I love leopard on you! OMGGGGG i've been looking for a leopard chiffon tunic type of blouse for over 2 months!! i can't believe this is jacket.. you are so badass i swear.. hahaha is it like a kimono jacket?? Oh my goodness, that is too funny that carmageddon thing...sheesh! Loving the leopard top! Have a great relaxing weekend and definitely don't drive! that shirt is purrfect. really though, it's the cat's meow. love this jacket as a shirt - but reeeeally love how you accented with the orange bag and green bracelets!!! That lush jacket as a top is styling! Have a lovely weekend N! The location of these shots makes a fab backdrop. Very editorial-ish. It's always a good time to wear leopard- even on the weekend. Have a great one. love the look.. you look amazing!! love the jacket/top.. how clever.. the shoes are amazing... love the blog!! I am so obsessed with leopard and cheetah at the moment. CAN. NOT. GET. ENOUGH. Love your outfit, hope you had a wonderful weekend. I was in LA the weekend before carmageddon. I'll be back in August. Should we try to meet up? Ok, your weekend sounds amazing! Almost as amazing as those shoes! So glad the 405 is no longer a daily part of my life. Hope your weekend was relaxing. I adore the combo of leopard and red, it's so polished. Just found your blog, and I'm so glad I did! Glad you survived Carmageddon. hehe. Looking fabulous as always, Nicole!! I want those heels!!!! !